I’ve written about a Mouse, a Madras dress, Marie Kondo, my Mate’s stored secrets and Louisa Adams’ Moving adventure during our Big Move from a tri-level to a single floor. Now we are settling in. 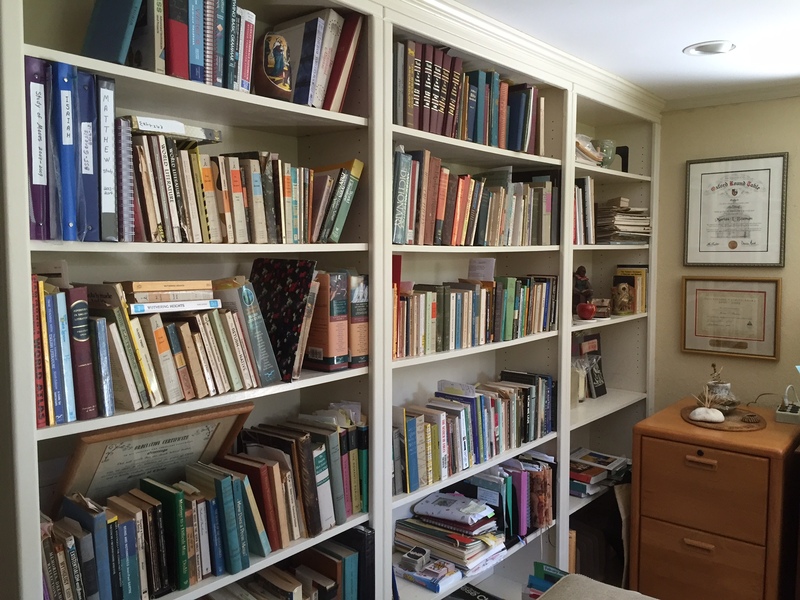 You may be curious about what happened to all the books originally stacked on the shelves of my three adjoining bookcases next to my former writing desk. I gave away plenty. This week, Ian got my 1950 copy of The Peanut Man. He sucked in a gasp when I told him George Washington Carver was sold as a slave in exchange for a horse but bravely used God’s wisdom to find hundreds of uses for sweet potatoes and peanuts. 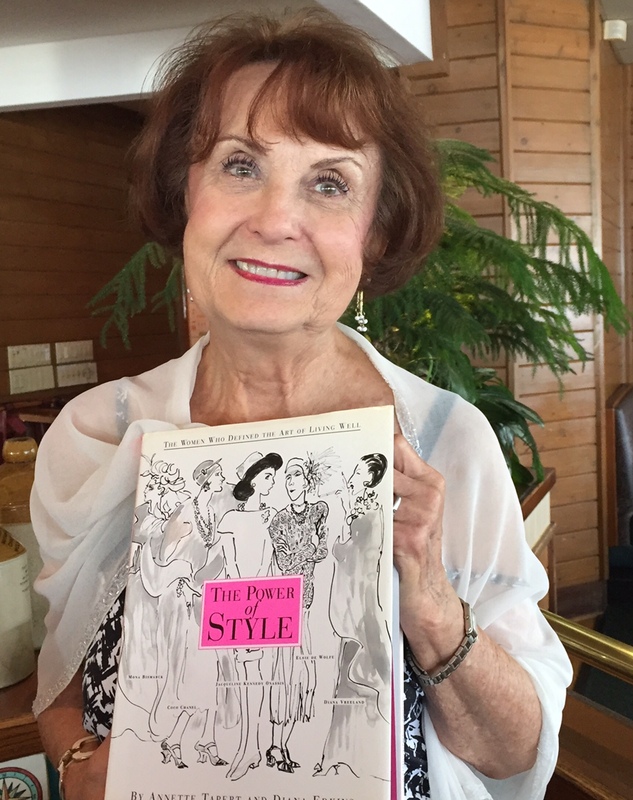 Another book, The Power of Style became a birthday gift to my friend Carolyn, a stylish woman whose blouse underneath declares she is cleverly disguised as a responsible adult. Back in May I started with three floor-to-ceiling bookcases, now condensed to just one. My other books have cozy nests elsewhere, cosseted in small spaces all around our new home. 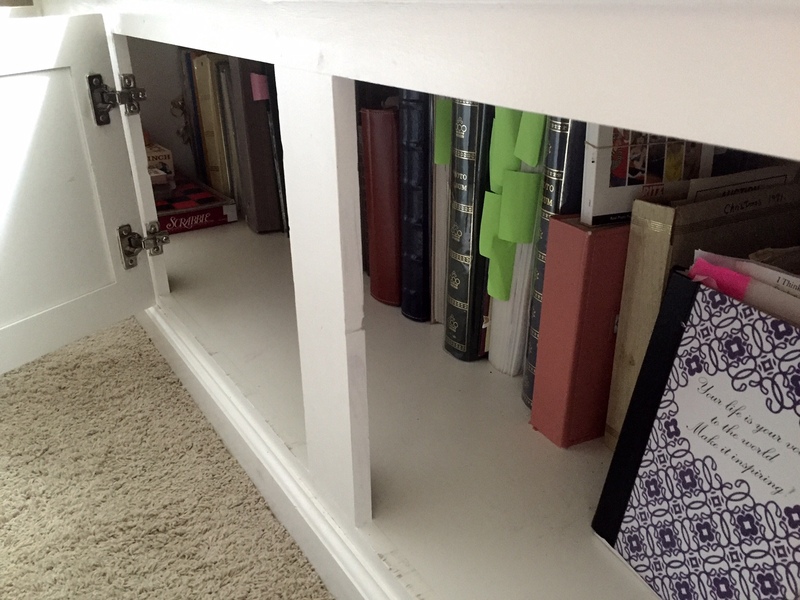 A book rack in a corner of the great room holds books for morning meditation, including my lilac gratitude book. My journal for rants and other facts of life has gone missing. It has an iridescent Tiffany-style cover. If it turns up at your house, please let me know. I’m dying to have it back! 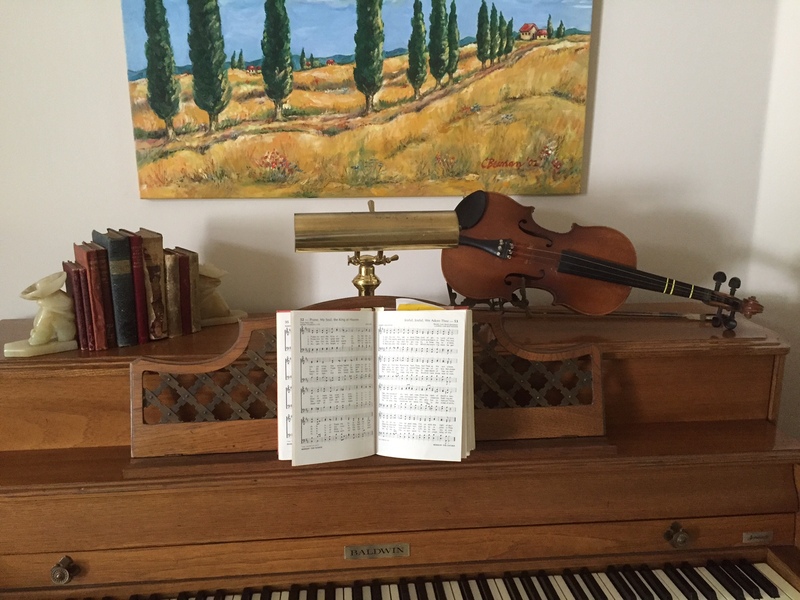 Old books, my hymn books, and a violin in-need-of-repair with the bridge missing fill an alcove in the hallway. Cathedral ceilings have amplified both glorious sounds and sour notes – ha! The dining room has built-ins for china and books. 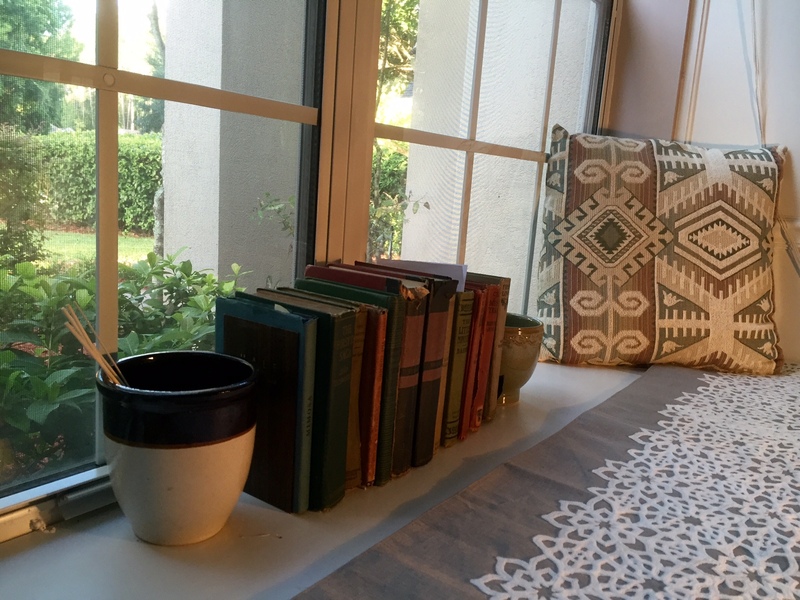 On the window seat, small crocks (one from Mother) hold in place more old books, including the one at the far end on my blog banner. Underneath, a long cabinet swallowed up over two dozen photo albums and about a dozen journals. Above the media center in the living room, a sturdy candlestick holds up Sonnets of the Portuguese, Beatrix Potter’s Lakeland, Sarah Ban Breathnach’s Simple Abundance popular in 1995 and Alice in Wonderland, a gift from son Joel and wife Sarah, Christmas 1998. Coral from Key West separates these from another stash of antique books. Under the sofa table, brass butterflies hold some of my books by Mennonite writers, a collection by my favorite short story author, Alice Munro, one of John Updike’s novels, Judith Viorst books and The Story of Lady Almina and the Real Downton Abbey by the Countess of Carnarvon. 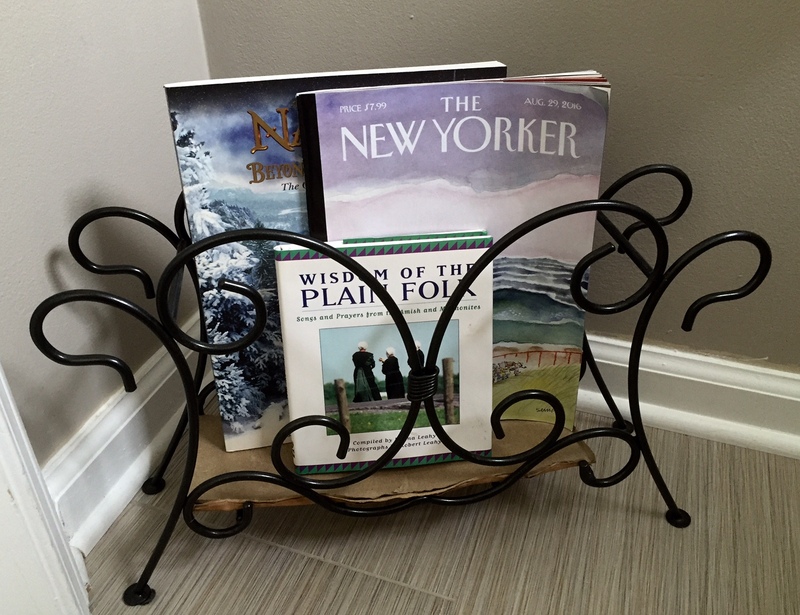 The water closet, should you choose to linger on the “throne,” offers a changing display of reading material. And finally, I pared down kitchen recipe books. What remains has a distinctly Mennonite/Amish vibe with slender tea-time booklets at right. 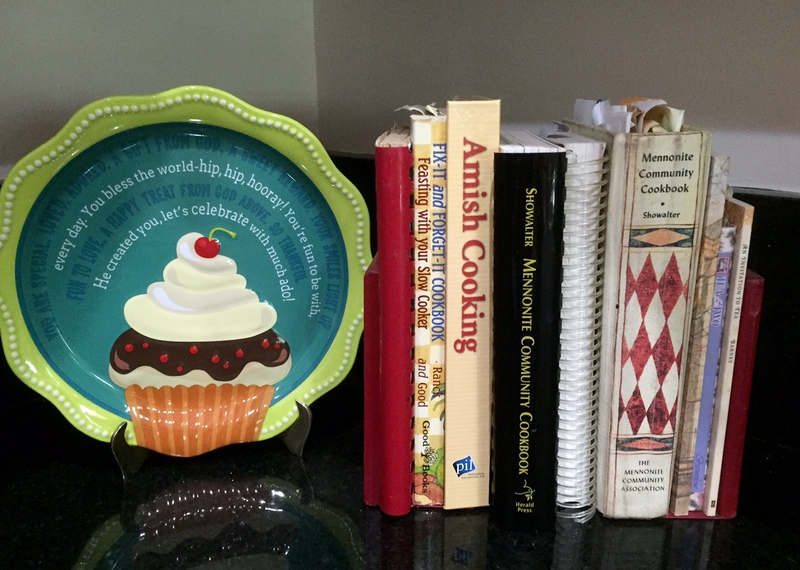 Most recipes are available online, so the 4-inch thick encyclopedias had to go. Besides, my favorite recipes sit snug in a computer desktop file. 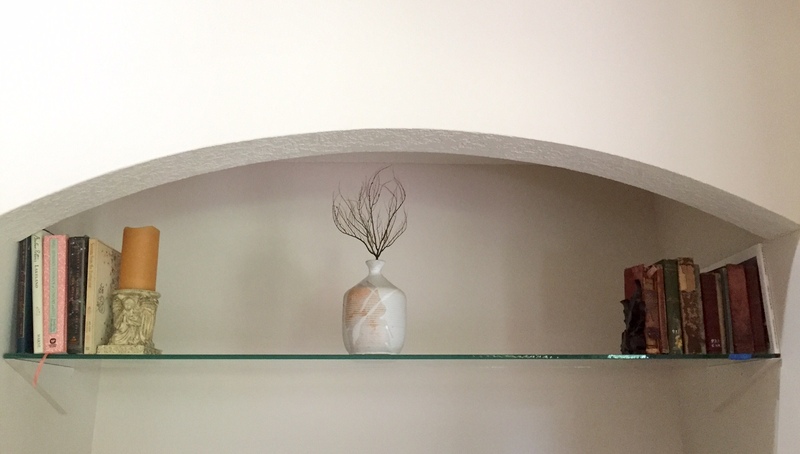 Four months ago in our former home, I began with three adjoining bookcases, jammed with books. In the photo below, I had already started purging. Space for my books is much smaller now, condensed to just one. Besides, it was time to let some tomes go. Looking back, I see my method for giving away or keeping has been more intuitive than rational. Autographed books, gifts from friends or family had to stay. Hardest to let go – textbooks laden with notes I had labored so long to create. A glitch occurred as we tried to stabilize this bookcase. 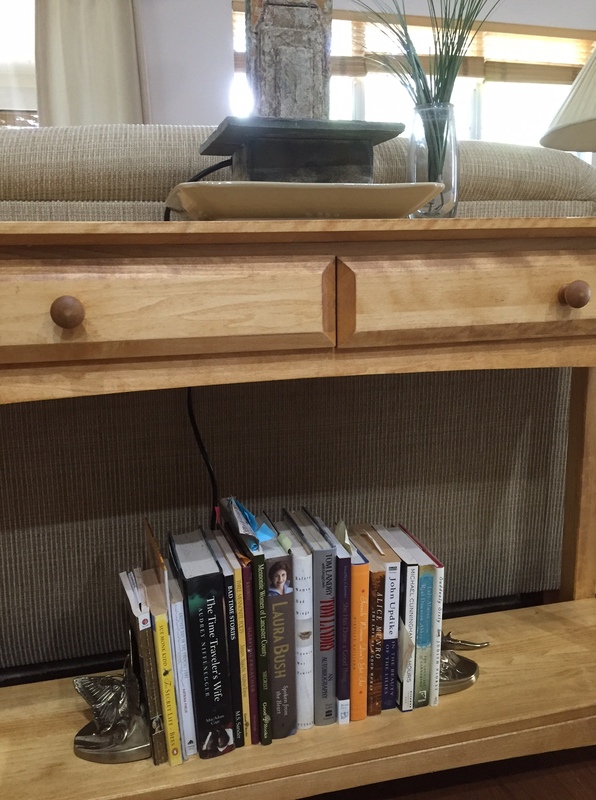 When the cable guy came, he angled the bookcase to hookup the internet and pushed the oak file-case forward. When he finished, he shoved the case too far to the right, so we couldn’t get it pushed back to the wall. Because it was overloaded with books and too heavy to move, son-in-law Joe and husband Cliff relayed books from case to floor and back again, so the behemoth could be moved into its final resting place. Bless them! Oh, nothing furnishes a room like books. What books are among your favorites? Which ones would you never, ever part with? Do you have places to showcase special books? What other room accessories do you value? More quotes about books are welcome here too ~ thank you! Thank you for the tour, Marian! Your house looks so bright, cheerful, and welcoming. 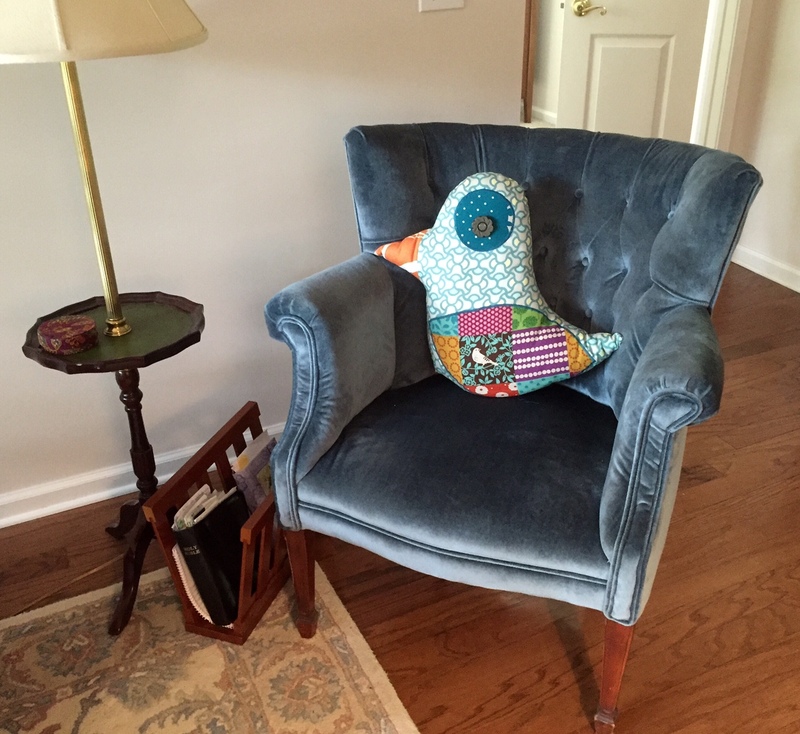 I love the bird pillow in the chair. Our house is a mess–literally–with books. We have books in every room–well, not the bathroom. Book cases, stacks, displays. . .And we also have many of the books our daughters did not want to part with. I love that, Marian! Thank you! HA! First responder! (Sorry Merril) Though who knows – maybe yours will come up first! Happy to be in the first lot instead of towards the end! In haste though – thanks for sharing us peeks into your lovely new home. Yes, a home without books is a home without … fill in the blanks. John Kieran: I am part of all I have read. Chinese proverb: A book is like a garden carried in the pocket. I would never part with The Collected Works of Oscar Wilde; Hermann Hesse: The Glass Bead Game; any of my books by or of Jung … actually there are too many to name. My diaries, journals, notebooks, dream journals would be the first I would try to save if I had to. Susan, I’m going to count you as first responder since your comments have to fly all the way from South Africa – ha! Thank you for add to the quote collection. I’m not familiar with most of them. You could see Jung’s Memories, Dreams, and Reflections on my bookshelf now. Every once in a while I pick him up and review some pages; my edition is dated 1965. I’ve been enamored with him ever since high school when I think I wrote a paper on his theories. Oh Marian, we did it again. You will chuckle when you see my post later today. I love how this essay contains who you are — your values and relationships and aesthetic. Blessings as you establish the routines in the new spaces that will continue to nourish your soul as you nourish your many friends online and right there in your cozy new place. I look forward to seeing your version of this topic. Serendipity and synchronicity continue to tag our relationship, Shirley. Maybe some DNA got commingled as our ancestors made the voyage to America. Or, more likely, inter-marriage from way back. Ha! Your new place looks wonderful and already has your personality! You have found perfect places for your books, photos and journals. So sorry to hear you lost/misplaced your current journal. Hope it shows up soon. We have some similar books including The Story of Lady Almina and the Real Downton Abbey by the Countess of Carnarvon. There are books in every room in my house too, always have been and always will. I still haven´t found homes for all the books I brought along. I left so many behind and every now and then I reach for an old friend – and it isn´t there. Of course, I brought my collection of Jane Austen books with me! You can take comfort in the fact that a title you wish for is probably stored in Canada and retrievable. Thanks for the great quotes. I’ve read Pride and Prejudice, of course, but don’t remember Jane’s wish for “an excellent library.” Thanks for adding to the growing stash here, Darlene. Plight is the right word, Anita. You know the pain of it – and yes, I do remember your posts with photos of your bookcases. Yes, I didn’t realize how joyful (and relieved) I’d feel passing these books along. It’s not exactly trash —-> treasure effect, but you get my drift, I think. Thanks for adding to our lively conversation here! You know, Anita, I didn’t notice the error. I guess my English teacher eyes filled in the word. Sometimes I make typos or grammatical errors on other blogs, and I’m embarrassed but powerless to make the correction. Maybe their eyes, like mine, just gloss over the mistake or so I tell myself – Ha! No, you didn’t tell me about the wrong book placement. I guess you have to think that it will bless another reader’s heart as it has yours. I keep losing things. That’s my problem. Neither of my glasses have appeared, and I’m still looking prayerfully for my “lost” journal. What a lovely tour through your new home through the eyes of your books! Books have always been at the heart of my world as well, and I enjoyed seeing how you deposited your favorites after your move. Pairing down, as difficult as it is, seems to bring into the light what is most precious to us, giving it room to breathe. Thank you for an inspiring look at change. Your phrase: “an inspiring look at change” stands out, Dorothy. Books are a huge part of my life; in fact, I view them as friends, and they were a big part of the move – obviously was a big deal after a 37-year accumulation. Thanks so much, Dorothy! Marian, your new home is lovely! I admire your discipline in purging all those treasures but I see you have shared the joy and found nice homes for them. Our home is loaded with books in nearly every room and I can’t imagine it any other way. You are a role model in the fine art of sifting and sorting snd should the need arise, I can refer to all you have shared. Enjoy your new home. It must be such a relief to be settled in. Although this post is mostly about my books, your sharp eyes caught a glimpse of our new home around the edges. Yes, it is a good feeling to settle in at last. It will be a double relief when we can sell our former house. Thank you so much for reading and commenting here – and offering to share other posts about the purging. Wow, Kathy! I would never have believed I could get rid of so many books, but when I saw how joyfully others accepted them as gifts even, the purging took on a pleasant (and unexpected) life of its own. Your new home looks beautiful, Marian. I’m so happy you’re settling in comfortably. I have book everywhere in our home…and I wouldn’t have it any other way! My posts lure book lovers – and I wouldn’t have it any other way either. Gee, thanks, Jill! Marian — I’m so impressed — clearly you’re an expert parer-downer! A minimalist, I’m a phenomenal book foster parent. I bring in one book at a time, love it to pieces, and then find a fantastic home for it. You are Marie Kondo’s dream, your home a revolving door for books. The fact that Cliff made a schematic of our new house made me aware of how much space was available for my books. My paring down was a necessity which has become (inadvertently, actually) an inspiration to others. Cliff is such a packrat but yesterday he presented me with this statement: “It’s a good thing we moved because I’m finding artwork I haven’t seen in years – and actually having fun organizing.” He also gave me about 20 more pounds of paper to recycle at the bank – ha! Books everywhere 🙂 love them. Have you connected with For Reading Addicts on fb? They often show pictures of Nooks and Crannies, places with books and places to read. I commend you on your literary discipline! Your purge yielded some very aesthetic results, but shedding books is always a painful process. (Mine remain unpurged, so I’m REALLY hoping I never have to move to a new house…) I hope you have many years of making sweet and sour notes in your new place! Love how you gave us a sneak peek into all the nooks and crannies where you have squirrelled away your most prized possessions. I gave away so many books when we moved eight years ago. I think they have been replaced since then, and the process has to start over again! Thank you, Elfrieda. That’s the book lover’s dilemma, isn’t it! Part of my solution is to borrow books from the local library. Still I have to buy some, particularly ones from Mennonite authors who are not generally featured in their “stacks”! The only way we could handle the “loss” was to give books to friends, donate books to a small library up the pass, and give books to two school libraries…and then entrust the rest to the Book Shop at Goodwill. It was hard, but we look back at it now and know we did the right thing. My purging actually began in 2008 when I retired from college teaching. I placed books for students outside my door, so they could pick through then when I was in class. 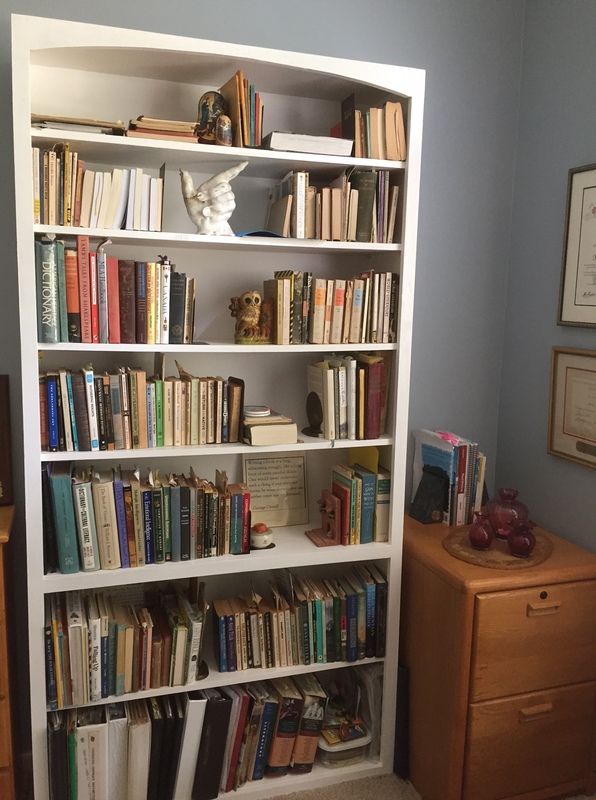 Then I hung an “Open House” sign on my office door and invited in other professors to have a go at my books and files, the accumulation from decades of teaching. I have a photos of professors digging through my files, some sitting on the floor for the lower drawers. It was a bittersweet experience. Yes, books are constant friends. I can’t imagine a life without their comfort and inspiration. The OPEN HOUSE was such a good idea, Marian, and leaving books for the students is wonderful. Your books were put to really good use, and that makes the separation much easier. I like you assessment: “will-power, determination, and some degree of ruthlessness.” The some-degree-of-ruthlessness really hit home because I hadn’t thought of it that way. Looking back, I recall putting myself into sort of a de-sensitized zone, so I could do the deed. Truly, I haven’t missed anything I gave away. Maybe, our attachment to things, books in this case, is part reality, part illusion. You really have made me think, Fatima. Thank you! Wonderful post, Marian! I also madly love books; there’s nothing better than a rainy day and a new book begging to be started. PS: Have you read any of the Police Chief Kate Burkholder series by Linda Castillo? Her Amish thrillers are addictive. No, I haven’t, Lynn. But the combination of Police Chief and Amish sounds a little anachronistic – and enticing. I’ll check into it. Thanks! Kate grew up Amish but left the plain life as a young woman. She returns to Ohio years later and utilizes her PaDutch knowledge to better serve and bridge the gap between Amish and Englishers. Your new house is looking marvellous. We had nearly 1000 books and I gave away lots. Nowadays, my Kindle helps me store books digitally and take up less space. The whole of the downstairs is still stacked with books in the new house. I suspect some of your great quotes and kernels of thought have come from books. Kindles are fine, but you also know the comfort of books. Besides inspiration, they would provide fine wall insulation too in your large stash downstairs. To each his/her own, Debby. There’s no need to pare down if you have space for a supply that nourishes your soul. Knowing I’d have less space, I approached my little “friends” (for so they are) and asked myself, “Who would like this book?” Matching specific books to certain people opened the door to more give-aways. Otherwise, I would have kept the hoard to myself. In the end, I didn’t have a choice. So far, I haven’t missed any books given away. Marian, It sounds as though you and your books are settling in nicely! Every bookcase in my house is full and now there are nothing but stacks. So last week I pulled out some big paper shopping bags I’ve been saving and am filling them with books. I’m sending off some of my books on writing to my daughter where I know I’ll be able to find them if I need them again. Then I’ll take several bags full to the Library for their November book sale. The stacks are getting to big! Is your daughter a writer too? How nice those books are in safe-keeping now. I feel so noble taking books to the library. Maybe you feel the same. “Books are the quietest and most constant of friends” you know. I’m getting SO excited about your book launch! Yes, she is a writer, Marian. And yes, it’s nice to know I can retrieve than any time. I’m not sure I feel noble about taking books to the library, but it reassures me that they will be picked by people who want them. I’m getting excited too! It’s quite an amazing process! It’s so lovely to know you have settled in your new home and may I say it looks delightful . Books , ahh books probably my favourite subject . You are so brave giving all those books away but what lovely nooks and crannies to store your special ones in . I have books everywhere . My husband has threatened to move out …it’s him or the books …oh dear . I know it’s time to thin them down a little . Wuthering Heights is the book I’d never give up . Heidi is another because my mum used to read it to me , and it her encouragement , that gave me the love of books. Wuthering Heights is my favorite Bronte book. My students used to enjoy reading/discussing the book and viewing the movie alongside. I remember reading Heidi and could relate to her completely because of our Swiss heritage. Cheers to your mum for her encouragement. I believe I have seen a smidgeon of your home on Facebook – lovely rocker, wood floors, a pet – some books maybe . . . ! Sigh… The books… I’m proud of you, Marian. You’re my role-model and mentor. A book diet plus everything so neat and welcoming. I have about twice as many books as you had because I still have most of Vic’s. My birthday gift this year? A book, of course. I have ideas for where to give them away. My winter project. You’ve done a great job decorating with books. I decorate with books if you count stacking them on coffee tables, couches, bedside tables, desks, and floors. I’ll accept your plaudits. Thank you! Actually the purge began in 2008 when I cleared out my office at the College. I marked the pain of that purging with pictures – a photo of my 5-year-old grandson surrounded by books in my office is one memento I carry from those days. An inveterate reader, Curtis, now 12, carries on the tradition with his Kindle Fire. By the way, I love reading about the fine way you decorate with books, Elaine! We have just one bookcase now but we did have more. Like you there has been some purging and giving away but over a period of years rather than months. Oddly, I was looking at the shelves just the other day thinking I should probably rehoming some more that I never use. It’s either our age or stage in life that gives us the impulse to pare down; I truly understand, Marie. I don’t miss a single thing I gave away. Also, I borrow books from our public library and buy only if the book is not available there – like those from my friends (lots of them you see here!) who have written memoir.